The Players: Narrator, Jesus, Samaritan Women, 2-3 Disciples, Townsfolk. Note: Narrations in [brackets] can be skipped for better flow of the text. Numbers are verse numbers. This sermon continues the Lenten telling of the great teaching stories of John. Last week we learned what it was to be born again. This week we learn about life-giving water, and the life-giving refreshment of conversational encounters. Our search for refreshment, for the living water of life, can be frustrating, as it was to Moses and the children of Israel. Most of us have likewise wandered in the wilderness of wondering, trying to decide what to do with the rest of our lives. Perhaps you have had a time in your life when you’ve wondered what job to take, what college to attend, what spouse to marry. For me, this day, the story of Jesus and the Woman at the well is about the refreshing presence of God in those conversations that just happen. Eighteen years ago, in 1987 I was a chaplain at Saint Stephen’s Episcopal Day School in Alexandria. I enjoyed my work immensely. 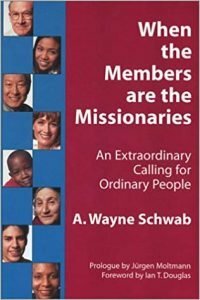 I had been out of seminary almost two years, and yet part of me missed parish work. I loved being a Chaplain. I loved parish work. Adding to the fun, there was talk of a merger between St. Stephen’s, a boy’s school, and St. Agnes, a girl’s school. They were working to merge the two schools, a prospect that there was some dissension about and which made me a bit nervous about my job security since the other school had chaplains, too. And so my mind was churning. Chaplain or parish priest: Which will it be? What should I do? When I worked as a deacon at my weekend parish in DC, I loved it, and wanted to do more, too. In this state of churning mind, I went to the nearby Virginia Seminary bookstore to browse and secure some free refreshments (you college students here will appreciate that) at a book signing party. A Bishop named John Spong had just published a book. Now I know Bishop Spong is a controversial character. But for me, he was living water. Within days I contacted the head of the National Association of Episcopal Schools that finds Jobs for Chaplains. I told the executive that I wanted a Parish with a connection to a school, where I could work half-time at each. The very next day, a Texas rector called her up. “I’m looking for a priest who can be a part-time associate rector and head chaplain at our growing day school,” he said. What a coincidence! That’s how I got to the foreign country of Midland, Texas! “He told me everything I ever did,” said the woman at the well. She was changed, made new. Last week, I dusted off an old book from my shelf because I thought it fit this sermon. Jean Paul Sartre’s 1944 Play, No Exit, (have any of you here read it?) portrays Hell as a conversation without the possibility of redemption. Garcin, Inez and Estelle are locked in a room with no windows, and no way out, for eternity. They seem to have been chosen by the valet for their personality incompatibility: Each of the three loathes one of the others and likes one of the others. But the one each one likes is the one who hates in return. There’s no hope, no redemption, no possibility of change of personality or amendment of life – life is already over, so what’s to amend. And, symbolically, there are no mirrors allowed in this hell. There’s no way to look at self evaluate the need for a change. Ah, the mirror that is not in Sartre’s hell is in Jesus’ daily life. And so the woman who the Spirit of living water had prepared for this encounter, was ready to hold up her life to God’s mirror and find some room for change, for redemption, for repentance. Like each of us, given the right time and right place the right gentleness of God, we’re ready to see. There’s another example of life-giving change that illustrates some of the imperfections is life. In my teen years, I loved watching David Caradine’s “Kung Fu.” This was a Chinese-American young man who had been trained in the martial arts and the art of life in a Shaolin temple in the mid-1800’s. Having killed the emperor’s son to protect his master, Kwai Chang Caine fled to San Francisco, wandering like the Israelites, who in today’s Exodus water story, journeyed by stages. In encounter after encounter, Caine is subject to the scorn and ridicule of strangers because he looks Chinese, a race subject to derision and persecution even while they were employed to build the web of railroads crisscrossing the American Western Frontier. I bought the DVD redo of the whole first season to share an important childhood wisdom-story with my son. I remember loving his encounters. He never returned an insult. He always treated each person as God’s child. Inevitably, Caine’s life was threatened and he stopped his attackers with his Kung Fu skills. He also inevitably defended the poor and helpless, and often from the same abusers that threatened him. Many of the episodes are exciting for the skill of the hero in defeating cruel abusers. But, I discovered something as an adult I hadn’t seen as a child: they’re sometimes depressing for the lack of repentance or change on the part of the abusers. He rescues but the evildoer returns to do evil again. In the gospel, everyone is subject to the redemptive power of life-changing water. Even a hero can be trapped in a place of No Exit – unless there is the possibility of redemption and change for all in that story. It is the ministry of God that you and I can be that mirror of Christ for our neighbor. God is at work in the unexpected encounters of our lives. May each of us bring living water to our neighbors, bringing springs of water gushing up to eternal life.